The Big Wobble: Tropical storm Tembin to batter Philippines days after tropical storm Kai-Tek affected 200,000 people: Active Kanlaon Volcano and quake watch! Conditions have been poor in past days due to tropical storm Kai-Tak which left more than 40 people dead in landslides in the central Philippines. Yet another tropical storm, "Tembin" is approaching the approaching the area with wind gusts of 85km/h. More than 35,000 families or almost 160,000 people in Eastern Visayas and Caraga region were affected by Tropical Storm Kai-Tak or Urduja to the locals, the National Disaster Risk Reduction and Management Council (NDRRMC) reported Saturday. The storm has also cut power supplies to thousands of people. 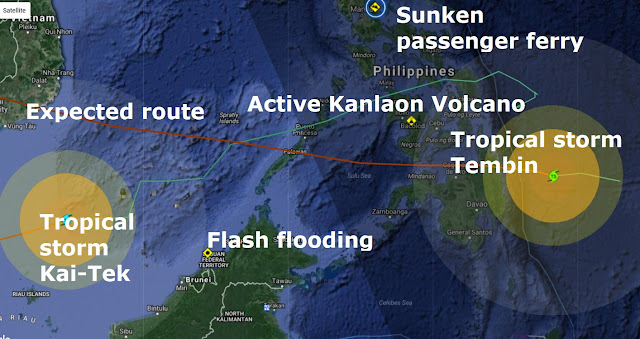 Quake alert: Active Kanlaon Volcano in the Philippines which was shaken by up to 2,234 volcanic earthquakes in less than 48 hours last week, with a coronal hole on our Sun spewing solar wind towards Earth and new tropical storm Tembin set to batter the volcano's vicinity with severe winds and torrential rain in the coming days which, together, could very well signal a major quake or a volcanic eruption..Stay tuned.